We are entering a new era where digital authoring tools allow us to develop reading-from-the-screen experiences that will captivate audiences who come with expectation of ubiquitous rich-media content. I am a digital first, transmedia storyteller. I work in a team with novelist Kate Pullinger and digital artist Chris Joseph, to produce Inanimate Alice, the fictional adventures of a young woman growing up in the early years of the 21st century. Over ten increasingly complex and interactive episodes we accompany Alice from the age of eight, in China where her father has gone missing, to her mid-twenties, when she is a game designer on a mission to save the world. Looking back, I have come to appreciate that is a story that was “born digital.” I don’t know whether it was Kate who first coined the phrase but it took several times of hearing it and reading it before I fully understood the potential impact of that concept. The series didn’t emerge from a printed book; it is not a translation or adaptation of something that was once it print. It was written, produced and directed as a YA chapter book for the screen. This production describes what looks to me to be a new model for creativity for the “book” business, one that reflects the development processes of the movie and computer games industries. This, in turn, creates considerable opportunities when designing the story as a multiplatform package from the outset. We are almost halfway through the story arc and at a pivotal point for the business model: seeking a publisher/distributor that “gets” the digital narrative. It hasn’t been as easy as one might hope. 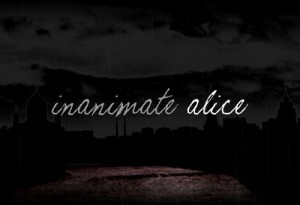 Today, Inanimate Alice is a multimedia interactive fiction, produced using manipulated images, text, games, music and sound effects. It began as the back-story to a movie screenplay call E|Mission, a sci-fi thriller I had written in 2003-2004. The momentous events in that tale called for some explanation of who Alice is, her relationship with her digital friend Brad, and what took place that led to her being the one person who would save the world. Since then, you might say, the production has taken on a life of its own. Back in 2005 we were focused almost exclusively on story. We were setting out the story arc, creating a world in a way; Kate, Chris and I settled on the idea of an interactive back-story, told in episodes. We describe Alice’s life, first her travels around the world with her parents, then at school, in college, and then at the video game company. At the video game company she would finally encounter the characters from the original screenplay and embark on their world-saving enterprise. At the story progressed, we envisioned each episode becoming more interactive and complex than the one before, thus reflecting Alice’s character growth and her developing skills as an animator and computer game designer. To date, we have completed and made available four episodes online. The first five episodes of the series use manipulated still images to form the backdrop. With episodes six and seven we will shift gears, upping the tempo with digital video to achieve a racier, grittier feel. For the final episodes we will shift formats again, this time using a 3-D game engine as we delve ever deeper into Alice’s extraordinary world. We were, and remain, an international crew, working virtually. We launched episode one, about Alice’s life in China, in 2005. This episode was awarded the Premio per l’arte digitale from the Italian Ministry of Culture, helping establish an audience overseas. Today, we estimate episode views to be well in excess of one million — in the US, Europe, Asia, and especially Australia and New Zealand — and the audience continues to grow with each release. Now, with the fifth episode in production, we have gained a better understanding of the wider implications of the digital opportunity, particularly among audiences abroad. The early episodes were translated into French, German, Italian and Spanish for the European Commission’s Intercultural Dialogue initiative. That experience led us to think about different ways in which we might use Alice for something beyond simply reading. One area we considered was language training. Not only will the series reach a far wider audience in multiple languages, the prospect of easy toggling between languages provides further opportunities for inter-lingual studies. Inanimate Alice has, indeed, proved popular with international schools and language learning schools around the world, particularly in AsiaPac countries. We asked Dr. Jess Laccetti, then a student in Creative Writing and New Media, to develop complementary educational materials, ones that we hoped would inspire and equip a new generation of teachers embracing Web 2.0 education for the first time. Now, education departments at universities around the world use those lesson plans and worksheets as core materials for literacy and ICT education objectives targeting 10-14 year old students with widely differing competencies. Dr. Laccetti’s efforts have given two generations of students (educators and high school pupils) a title with which to embrace and engage in education 2.0. Inanimate Alice has been able to function as a literacy stimulus across wide age groups and among differing capabilities. For YA readers, growing up with Alice reflects the arc of the story; relevance and mutability across educational needs suggests that students can grow alongside Alice, from class to class, from year to year across several curricula. At the academic level it is a high-quality text that supports the deep reading and re-reading necessary for sustained enquiry. At the other end of the spectrum, it encourages the hard-to-engage or reluctant readers to interact with educators, as well as other students. The puzzles and games have become more elaborate with each new chapter. This framework simulates a multi-tasking environment with a high-quality text as a base that teachers can use for many different outcomes including ICT education. Further, it acts as a primer for those who are not yet familiar with computer games. 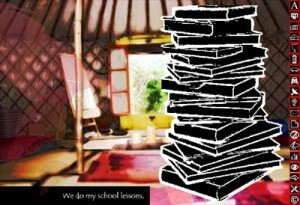 I believe that Inanimate Alice is a breakthrough project demonstrating a new kind of reading-from-the-screen experience. Is it a billion-dollar story? Perhaps…Our vision, a package that addresses movie, game, on-line and print outcomes from the outset, is designed with this in mind. It sets out objectives and addresses issues from the beginning. It would have to be successful, but not on the scale of a Harry Potter or Lord of the Rings to achieve that. Alice has become a bridge with the ability to connect technologies, languages, generations and curricula. At the half-way point, we find ourselves looking for the industry to meet us in the middle. DISCUSS: Can publishers transform into transmedia storytellers?